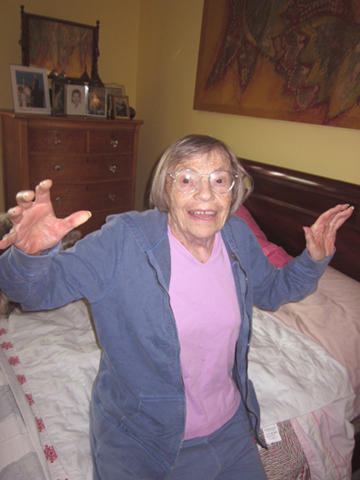 Last Saturday my family and I gave a gala party to celebrate the life of my mother Jan (a.k.a. Taffy), who died in December. We delighted in good food, good drink, and good company. Being basically lazy, I asked guests to bring food, which they did in abundance. Pam brought tea sandwiches, Debbie brought potato salad, Trina brought the biggest green salad I have ever seen, Ruth brought shrimp, Peter brought MORE shrimp in a salad with artichokes and cilantro pesto, Mary Stuart brought quinoa, Leslie brought delicate cookies, Mardi and David brought watermelon, and so on. My family supplied tubs of Bart’s ice cream with homemade sauces and tested a recipe from our friend Lark Fleury for pimiento cheese. Her recipe is quite different from my usual one; the mustard, onion, and relish add complexity to the spread. I gave most of the cheese to our friend Pam to put in some of her tea sandwiches, but my family also tried a bit on crackers. I know my mother would have approved. If you’d like to read more about the party, visit my non-food blog for a full report. Combine all the ingredients, beginning with just a dab of mayonnaise and adding more until the cheese is spreadable. Spread on bread/crackers or make small sandwiches. Store leftovers in the fridge. I THOUGHT I had taken a photo of the cheese in its final state, but it’s not in my camera. So here’s a better picture, of the day’s honoree, taken last year…. No comfort food in the world can compete with macaroni and cheese! My friend Alice from Dallas and I talk from time to time about writing a book called “Food to Die For.” Like most Americans, Alice and I grew up in communities in which cooking was the natural thing to do when a friend, relative, or neighbor died. Sometimes there isn’t much one can do for the bereaved other than feed them. Food represents all the love we feel, all the caring remarks we’d like to make, and all the memories we cherish. And let’s face it: cooking is a heck of a lot more constructive than crying. 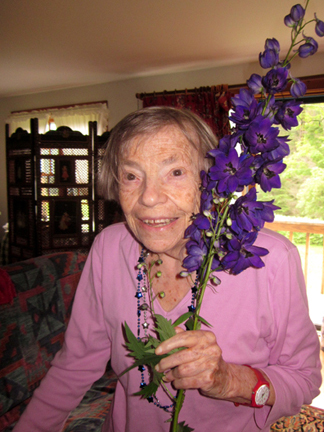 Alice grew up in Louisiana so her family brought gumbo, jambalaya, and pralines to the bereaved. I grew up in the northeast so my family tended toward more standard New England-y comfort food—ham, macaroni and cheese, and brownies. I know people who bring bagels and lox to houses of mourning, as well as stews, soups, cookies, and lasagna. The trick is to identify comfort foods that can be prepared in advance and don’t take much effort to reheat. 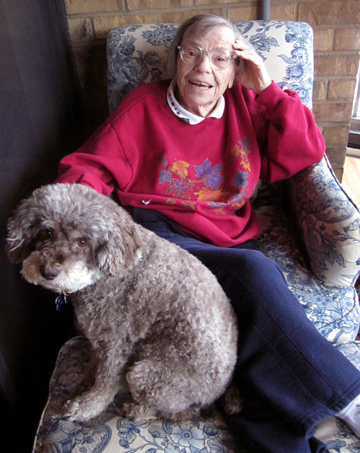 My mother Jan often billed herself as a “specialist in funeral baked meats.” When a neighbor died she quickly and efficiently helped relatives, friends, and neighbors organize the feast after the funeral or memorial service. Sometimes this included the favorite dishes of the deceased. Sometimes the menu consisted of any foods that could be prepared in a hurry. My mother’s funereal feasts were always well received. People liked (and still like) to munch while sharing memories and condolences. It seems appropriate then, that my mother’s own memorial service on January 7 was followed by copious and delectable food. Right after the speeches and hymns at the Federated Church in Charlemont, Massachusetts, the church’s pastoral care committee put on a lavish spread of both savory and sweet finger food. It lived up to my memories of the events catered by the now defunct Charlemont Ladies Aid Society. Later in the day relatives (some by blood, some in spirit) gathered at our house to chat about Jan and life … and of course to eat and drink some more. Not being my mother, who liked to be thorough and was highly organized, I didn’t make both a turkey and a ham. I made only a ham. (Actually, I didn’t even make it myself since when my neighbors Will and Lisa offered to do something I handed the ham to them for baking!) There was plenty of food, however. 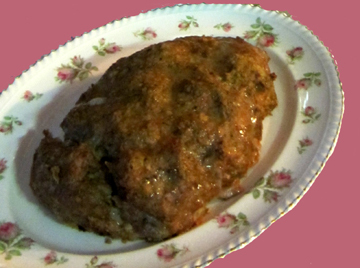 My friend Peter, who considered himself Jan’s third child, brought a huge dish of herbed chicken meatballs. Our neighbors Stu and Cathy prepared the world’s largest bowl of salad. My mother’s honorary goddaughter, Anna, brought fabulous artisan bread. My cousin’s daughter Kyra made yummy cupcakes decorated with snowflakes. And Jan’s aide Pam contributed her dense, delicious applesauce cake. I had very little to make: a quick appetizer, the salad dressing, my grandmother’s key-lime angel pudding, and a large portion of macaroni and cheese. If I have to be honest, I must say that I didn’t make all of those either since Pam helped A LOT! But I organized them. Macaroni and cheese was among my mother’s funereal standbys. It is easy to prepare in advance, and it pretty much defines comfort food. So I decided to make it for her. My standard mac and cheese recipe isn’t elegant and it isn’t rocket science. It’s pretty darn tasty, however. And it comforted me not only to eat it but to prepare it in memory of my mother. She would have enjoyed her party. The recipe below may be expanded pretty much as much as you like. I hope it graces the table at your next memorial service—or even your next cozy supper party. In a heavy saucepan melt the butter, and stir in the mustard. 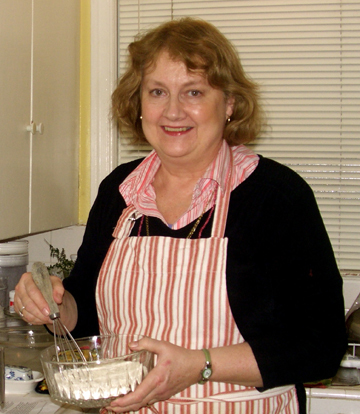 Whisk in the flour and cook, whisking constantly, for a minute or two. You want the mixture (the roux) to cook and merge but not to get brown. Add the milk a little at a time, whisking constantly. Bring the sauce to a boil. Add paprika to give it a pink tint plus salt and pepper to taste. I love salt, but remember that the cheese you are about to stir in is salty; I’d start with 1/2 teaspoon and add more later as needed. 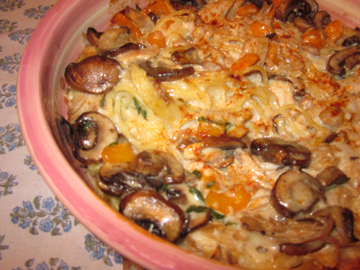 In a 1-1/2 to 2-quart casserole dish combine the macaroni and the sauce. Your casserole should be nice and moist. If for some reason it looks a little dry (this can happen if your cheese is very absorbent), stir in a little more milk. It will evaporate in the oven. Take a tiny taste of your sauce and add more salt if you need to. 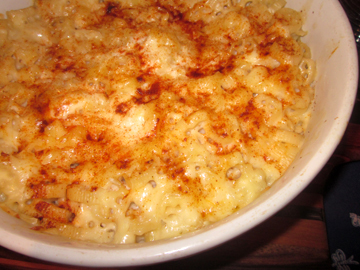 Sprinkle the remaining cheese on top of the macaroni mixture, and top with a little more paprika. Cover the dish and place it in the oven. Bake for 20 minutes; then uncover your macaroni and cheese and continue to cook until it is nice and bubbly, 10 to 15 minutes more. Serves 4 to 6. 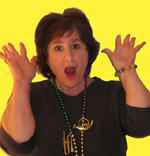 Marilyn Ferdinand co-authors the blog Ferdy on Films. She writes about film with wit and insight. She also knows a lot about food, particularly vegetarian food. Marilyn recently wrote on Facebook that she was in the kitchen preparing an Alsatian onion tart. 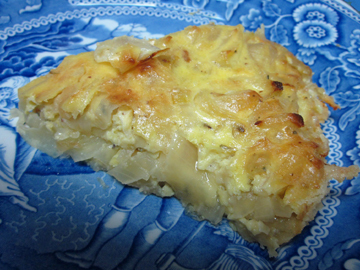 The combination of onions and pie crust sounded so perfect for winter that I HAD to ask for the recipe. Alas, her recipe was from a book—so I had to mess with it a bit in order to be able to publish it as my own. I added a little of this, altered a little of that, and ended up with a hearty tart that my family enjoyed very much. Add a salad, and you’ve got supper. If you’re interested in seeing and/or making the bars we served for dessert, visit this blog’s sister enterprise, Pulling Taffy. If you want to try this one, here is how you prepare the pastry. In a medium bowl combine the flour and salt. Cut in the butter. Add cold water, a little at a time, until the mixture can be formed into a ragged ball. Wrap the ball in waxed paper, and refrigerate it for 1 hour. Half an hour into the refrigeration, start working on the onions. In a sturdy Dutch oven over medium-high heat combine the butter and oil. When they are bubbly, stir in the onions. Stir to coat them and keep on them on high heat for a couple of minutes. 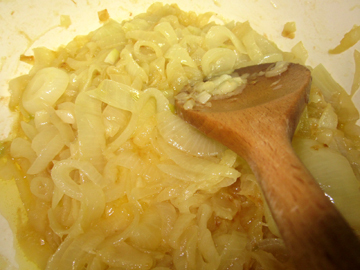 Turn the heat down to medium and cook the onions, stirring frequently, until they are a lovely golden color, about 30 minutes. Remove them from the heat. Roll out the pastry and place it in a 9-inch pie plate. Sprinkle the cheese on the bottom of the crust. Stir the flour, mustard, and seasonings into the onions. In a separate bowl whisk together the eggs and the half and half. Stir that mixture into the onion mixture, and pour the whole thing into the pie shell. Bake until the tart is set and slightly brown, about 30 minutes. Serves 4 to 6. 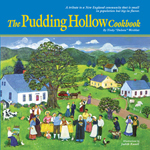 This coming Sunday, December 5, is National Comfort Food Day. I’ve recently been using up some of our Thanksgiving-turkey leftovers in one of my favorite comfort foods, turkey tetrazzini. Tetrazzini the dish (also made with chicken, salmon, tuna, and for all I know tofu) was named after Tetrazzini the singer. 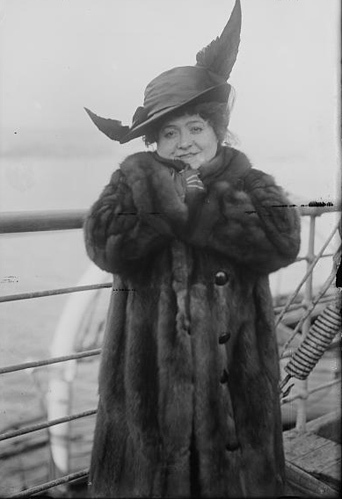 Luisa Tetrazzini (1871-1940) was a coloratura soprano known as the Florentine Nightingale. She allegedly first took to the stage at the age of three in her native Italy. In her prime she was the toast of opera lovers in both Europe and the United States. 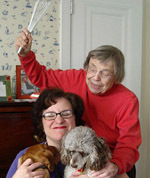 Although she was involved in a number of contractual lawsuits, La Tetrazzini was by all accounts a good natured woman. Small of stature but by no means small of figure (calling her stout would be kind), she adored glamorous gowns, jewelry, and hats. Like other many other sopranos (including me! 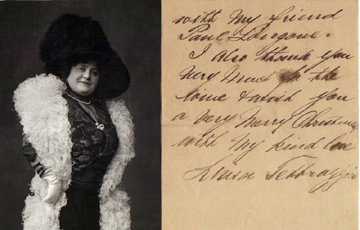 ), Luisa Tetrazzini had a weakness for comfort food. The precise provenance of the recipe named after her is in doubt; a number of different chefs and restaurants claimed to have invented it. It is clear, however, that it was created in Tetrazzini’s honor. Whoever originated it, turkey tetrazzini is my second favorite thing to make out of leftover turkey. (First on the list comes the humble turkey sandwich.) The bell pepper in my version isn’t traditional, but I appreciate the note of color it adds to this otherwise pretty much white dish. 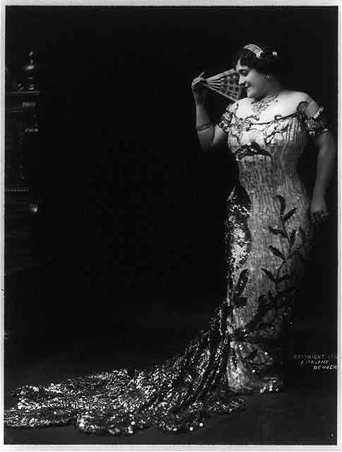 To hear Luisa Tetrazzini sing “Una Voce Poco Fa” (“A Voice Just Now”) from Rossini’s Barber of Seville click here. To taste the dish named after her, follow the instructions below. First, make the sauce. Melt the butter in a saucepan over medium heat, and whisk in the flour. Cook, whisking constantly, for 2 minutes. Whisk in the turkey stock and bring the mixture to a boil. Boil, whisking constantly, for 2 minutes more. Turn off the heat and stir in the milk and cream. Heat the mixture until it is warm; then remove it from the heat and stir in the seasoning, cheese, sherry, and chopped parsley. Set aside. Next, create the casserole. Place the cooked spaghetti in a 2- to 3- quart casserole dish. Cover it with about half of the sauce. Melt a small amount of butter in a frying pan and sauté the ‘rooms and bell-pepper pieces until they soften. (Add a little more butter if you absolutely have to.) Dust them with salt and pepper. Place the turkey on top of the spaghetti in the dish. Cover it with the sautéed vegetables. Stir the mixture just a bit to make sure everything is moistened. 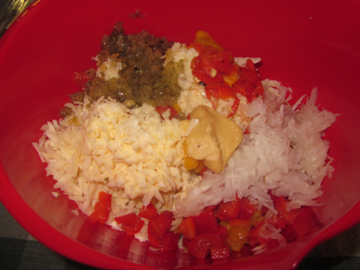 Top the mixture with the remaining sauce. If the tetrazzini looks a bit dry, add a bit more milk. Sprinkle the cheese on top of it, and throw on a little paprika for good measure. Cover the casserole dish and place it in the oven for 20 minutes; then uncover and cook until bubbly, about 10 minutes more. Serves 4. For sale right now on Ebay!